For many, the etiquette of sending thank you cards has been lost. When you’re mourning the loss of a loved one, getting these trivial things done can seem like a burden. Whether you choose to send thank you cards out within the first few weeks or not, here are some simple guidelines to help you along the way. Who Do I Send Thank You Cards To? In most cases, is it not necessary to send a note of appreciation for calls from friends as these have been answered. If you have callers who you have not spoken to, a thank you note may be sent. Generally, there are two types of thank you cards that are often used. The first is an acknowledgement card with a standard verse. The second is a simple blank note card of your choosing. Both types of cards are appropriate and are a good option. The blank cards allow you to write a unique message for each recipient. 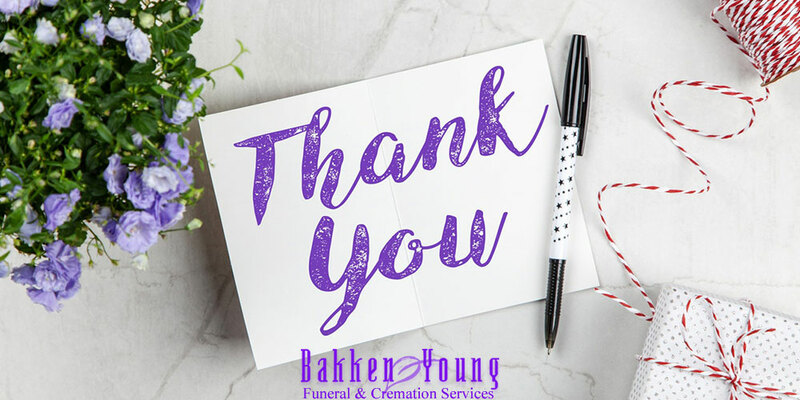 If you choose to use pre-printed cards, we recommend that you add a sentence or two to personally express your gratitude. Bob and I thank you for your support and consolation during this difficult time. The funeral service you performed gave inspiration and comfort to everyone present. I want to convey my deepest thanks for the wonderful buffet you arranged. You have shown us the kindness of a close neighbor and true friend. Thank you for your assistance as pallbearer. Your presence was a great comfort for us during our time of sadness. Thank you for being there. Those who receive your genuine acknowledgement of thanks will greatly appreciate the gesture. Do you know someone who may benefit from this article? Please share it with them as we hope to be a helpful presence during the loss of loved ones.